Mike Abernathy, a dog owner and manager of Whiteford Greenhouse in Sylvania Township, explained how he and his wife, Elizabeth Reiter, keep their three four-legged friends happy. “They like to run around the fence line. So we made a path for them, because they would have made their own,” he said. If you are going to put a path around the fence, or border bed, Mr. Abernathy suggested laying down weed barriers first to deter your dog from digging. “That way they can’t dig around the fence and you don’t have to pull weeds,” he said. He suggested laying mulch over the barrier. Rocks may work, but he believes that mulch is softer for the dogs’ padded paws. He finds that his pit bull, German shorthaired pointer, and Labrador-Dalmatian mix love to lay in grasses. Cats also like to hide in the tall grasses, he said. “They like to lay in the sun or shade, and hide behind things,” he said. His dogs love to lounge around larger bushy ornamental grasses like miscanthus or gracillimus. Irish moss can be used as ground cover. It is durable enough to withstand dogs and cats frolicking in the yard. 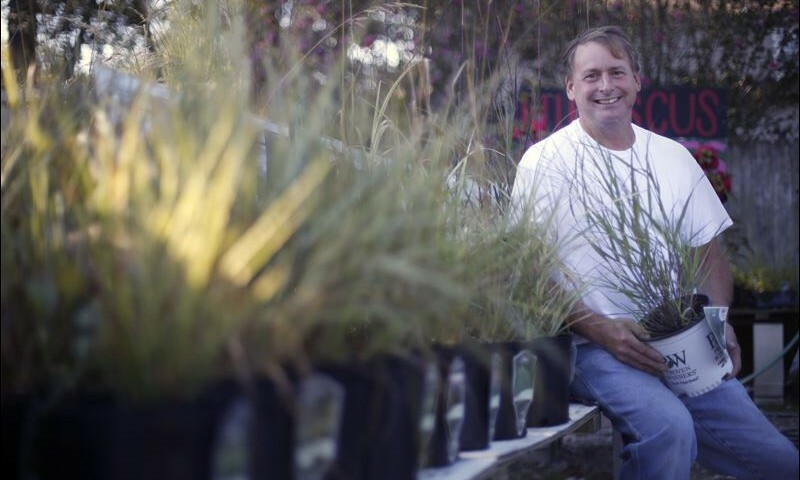 He plants ornamental grasses along the border of his property and has chosen tall varieties to match his taller dogs, but there are short varieties as well. Ornamental grasses Indian warrior and Dixieland also would work.